We know it’s important to pay forward the help, mentorship and generosity of those who have helped us along the way and we strive to make our community an even better place. 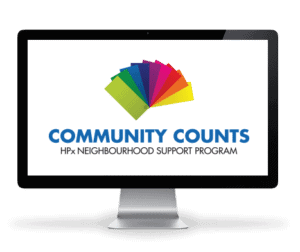 The HPX Media Community Counts program helps out local charitable organizations and business; helping empower them to maximize their impact in the community. HPX Media is proud to support our community by supporting local charitable organizations. Here are some of the organizations we are currently working with. Each year we donate a portion of our sales to a local charitable organization. In addition to this, we also lend our pixel-pushing abilities to help out organizations who may not have volunteers with that particular skill set. If you’re interested in applying to become our 2017 recipient, or require design/web assistance for your non-profit organization, please contact us today. While we would like to help all organizations, we can only choose those that are the best fit to ensure maximum impact. LUSH Valley is a nonprofit organization focusing on food security. We support projects that educate and empower people in the Comox Valley. We support the Comox Valley in gaining food-systems skills and knowledge to increase food security, self-sufficiency, and local food production across the region. The Comox Valley Food Bank distributes free emergency food to people in need. As a non-profit organization committed to reducing hunger since 1983, the CVFB gathers food and cash donations to support food distribution and collection programs. The CVFB reaches a wide range of urban and rural populations in the Comox Valley, from Oyster River in the North to Cook Creek in the South, including Hornby and Denman Island residents. Everybody Deserves A Smile (EDAS) is a Not -For Profit Organization that began as a grassroots project in Edmonton, right before Christmas in 2003. Four friends came together and left 88 homemade care packages on garbage bins in the backstreets of downtown. At the time they hoped to bring a smile to those living on our streets, letting them know that they were not alone and not forgotten that Christmas. Now, several years later, thousands of care packages have been given to the homeless, and this simple yet powerful purpose continues to this day. Although EDAS has focused on helping the homeless, it aspires to help everyone feel significant in some way. Our Community Counts recipient for 2015 is the Dawn to Dawn. We are thrilled to pledge a portion of our sales this year to support this wonderful organization. Dawn to Dawn is a non-profit, residential housing program that makes transitional housing possible in the Comox Valley. They provide homeless individuals and families with access to housing that gets them (or keeps them) off the streets. To learn more, visit their website. Our Community Counts recipient for 2014 is the Comox Valley Transition Society. We are thrilled to pledge a portion of our sales this year to support this wonderful organization. The CVTS provides high-risk women with safety, security and aims to end the cycle of violence through education, counselling and advocacy. To learn more, visit their website. Comox Nautical Days is Comox’s premiere summer festival. We wanted to help make the event an even bigger success and rebuilt the website and other printed materials as an in-kind sponsor. Our visions was to marry the existing brand with a newer look and feel while creating a fun and funtional website that created a buzz and motivated visitors to come out and participate. Let’s face it. There really aren’t a lot of people you can get together with and talk about fonts, colours and pre-press and not look like a total nerd. This is why we’ve founded the Graphic Artist Collective, the Comox Valley’s newest quasi-networking group. The catch? You have to be a graphic designer, or a student of graphic design. Otherwise, you just won’t have fun. Young Professionals of Comox Valley aims to promote social interaction and assist in the professional development of the Comox Valley’s future business leaders. The group is open to business professionals, employees and entrepreneurs under the age of 40 who live or work in the Comox Valley. Double Waters is a not-for-profit supportive housing facility serving the Comox Valley and surrounding areas. This is an organization that provides a home like environment, for 8 women who have completed a recovery program from drugs and alcohol. Military Family Resource Centre – The Military Family Resource Centre is a not-for-profit organization that helps military families adjust to life in their new community, as well as coping with the ever-changing dynamic of being a military family. By lending our graphic design services to the MFRC, we’ve created materials that are user-friendly and more meaningful to military families.